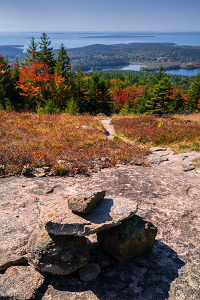 Located on the southwest side of Mount Desert Island near Seal Cove, Bernard Mountain is probably the most remote and least-visited peak in Acadia National Park. 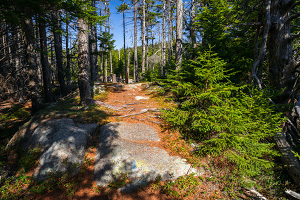 Hiking up the Bernard Mountain Trail and then back down the Sluiceway Trail makes for a nice loop that takes you to the summit of Bernard Mountain and its smaller sub-peak, Knight Nubble. While the mountain is densely forested and doesn't give up too many scenic views, it is a pleasant walk in the woods. The West Ledge Trail is an alternate start to the hike that does offer some nice open views along a ridgeline sometimes referred to as Bald Mountain. Time Required: 2-3 hours (3-5 for West Ledge Trail alternate start). Elevation Change: 930-ft elevation gain to summit of Bernard Mountain. To get to the Mill Field Trailhead, from Route 102 just north of Southwest Harbor, take Seal Cove Road west for roughly 1.8 miles. (As the road enters NPS land, it will become a rugged narrow dirt road.) Turn right (north) on a .5 mile connector road, then right again (east) onto Western Mountain Road. Follow it north-northeast for roughly 2 miles, then turn left at the final intersection to reach the isolated Mill Field Trailhead. You will see trailhead markers for both the Bernard Mountain Trail and the Sluiceway Trail. Hike the Bernard Mountain Trail which starts out heading west and then loops north making a gradual ascent up the forested mountain. After roughly a mile, the trail will intersect with the alternate West Ledge Trail (discussed below). Continue up the Bernard Mountain Trail to the summit. This mountain is heavily forested, so while the scenery is pleasant, it never gives up any big vistas. Just beyond the summit marker is a designated viewing area, but a newer batch of pine trees blocks what was the view. Continue down the northeast side of the mountain. The West Ledge Trail is an easy-to-follow trail with many open views and sections of bare granite, unlike the rest of Bernard Mountain. The ledges and views aren't stunning like some of the more popular peaks in Acadia, but the scenery is still beautiful. 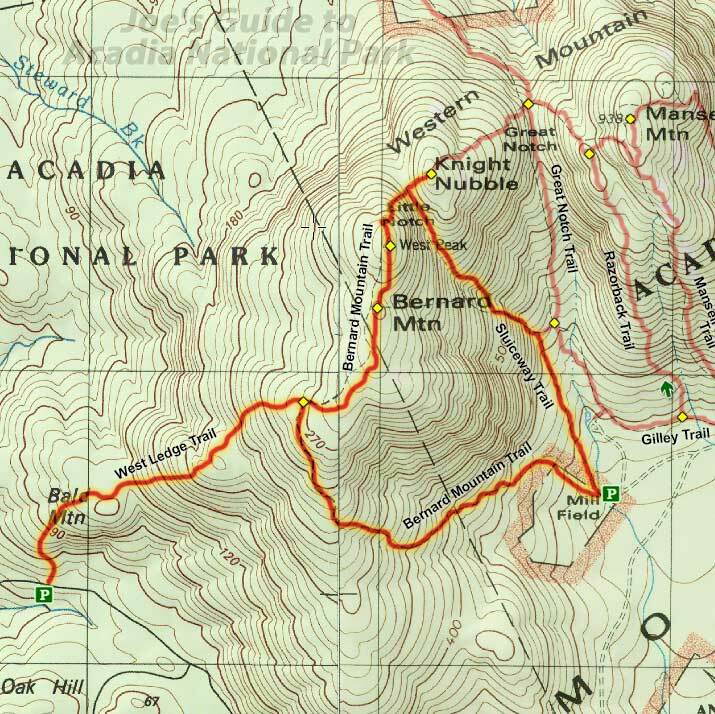 Once at the junction with the Bernard Mountain Trail, continue up to the summit, then take the Sluiceway Trail down to Mill Field, then take the Bernard Mountain Trail back up to the junction of the West Ledge Trail to complete the lollipop loop. Bernard Mountain and the trails of the greater Western Mountain area are admittedly not as stunning as the scenery along the more popular peaks in Acadia, but this hike is still pleasant. This hike is good for those who want to get away from the crowds to enjoy a nice walk in the woods.